On-site clinics were common until manufacturing declined the 1980s, but now employers are using them to improve productivity and cut medical costs. Interest in the development of the workplace clinic as a primary care delivery option has grown in recent years as employers move beyond occupational health and urgent care to offering clinics that provide a full range of wellness and primary care services. The workplace clinic itself is not a new idea. Up until the mid-1980s it was common for large employers to operate on-site company clinics to treat work-related injuries. Many of these clinics closed because of declines in manufacturing and workplace hazards becoming less common in these sectors. The reemergence of this care model is largely an effort by employers to improve worker productivity and mitigate skyrocketing health care costs. A 2012 survey conducted by the professional services company Towers Watson identified the top four reasons for the establishment or continuation of on-site health care centers: enhancement of worker productivity, reduction of medical costs, better integration of all health productivity efforts, and improved access to primary care. Today's work-site clinic is part of a growing movement away from traditional fee-for-service models, often adopting a patient-centered medical home approach with an emphasis on preventive care and increased patient education. Typically, the employer pays a monthly fixed fee for each insured member, allowing unlimited access to clinic services. While cost savings projections vary widely among third-party vendors providing clinic staffing and management services, many claim a 10 percent to 15 percent reduction in overall health care costs for employers once an on-site clinic is in place. Employers view workplace clinics as a tool to contain medical costs, boost worker productivity, and as an important perk for recruitment and retention of key people. For the individual employee, the clinic, with its primary care physicians, health assessment tools and educational opportunities, is seen as an important link to improved health and well-being. Because these clinics are so convenient, employees are more likely to get care before health issues become serious and costly. Health coaching makes it easier for employees to get help managing chronic conditions such as diabetes, hypertension and obesity. This focus on prevention and early interventions reduces emergency room use, the need for specialty care and hospitalizations. How widespread are workplace clinics? The consulting firm Benfield Research undertook a survey in 2011 to determine the prevalence of work-site clinics among companies with more than 500 employees. Their results showed that 33 percent of firms currently have a work site-based health clinic, and an additional 7 percent planned to launch a clinic within 12-18 months. While this seems like very high coverage, it is important to note that the majority of people are employed by small or mid-sized companies that have not typically been candidates for workplace clinics. When polled in 2010 by the Center for Studying Health System Change, only 4 percent of workers indicated that they had utilized a workplace clinic in the previous 12 months. With up to 30 million additional insured expected under the Affordable Care Act (ACA), employers are rightly concerned about employees' access to an already overburdened primary care system. The ACA does, however, offer incentives to smaller employers, such as grants to set up wellness programs and increases to the maximum wellness incentive to be applied to insurance premiums. While the scale of the workplace clinic will vary widely -- from a single physician working out of a 1,000-square-foot space to the 20,700-square-foot Living Well Health Center on the Redmond campus of Microsoft, common planning and design considerations apply. Identity: The design should strengthen the differentiation between workplace and clinical setting through separate material and finish palettes and branding elements. 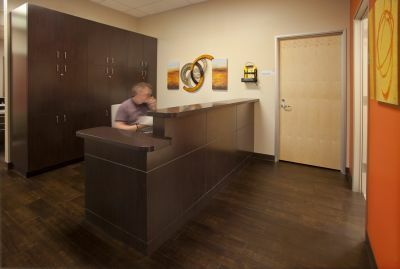 Locating the clinic along a common or public area adjacent to a main entry will simplify wayfinding and maintain workplace security. Engagement: The clinic environment should support self-directed wellness education. Knowledge kiosks, with computers linked to a searchable database of wellness topics, private consultation spaces for one-on-one counseling, and opportunities for non-scheduled interaction with providers should be considered. Flexibility: As the workforce evolves and changes, the clinical space must be able to respond as well. Analysis of data gathered through health assessments and biometric screenings can direct clinic programs to better address specific conditions. Methods for referrals outside of primary care, opportunities for incorporating telemedicine, group programs, and rotating specialty clinics may all require flexible spaces that can serve more than one purpose. A successful local example of this delivery model can be found in Paladina Health, which recently opened its 35th primary care clinic in Federal Way. Paladina Health utilizes an employer-sponsored medical home model to deliver higher quality health care at a lower cost to employers and individuals. At approximately 1,100 square feet, the new Paladina Health clinic supports two exam rooms, lab space, staff work stations and physician's office, and provides a calm, comfortable setting for patient-doctor interactions. Under the Paladina Health model, patients have greater access and control over their personal care, communicating directly with their physician via telephone, email or in-person clinic visits. While the work-site clinic has been most prevalent among large employers with a stable, concentrated workforce, interest is high among public employers such as school districts and municipalities. These groups are seldom concentrated at a single work site, so the clinic must find a convenient location that remains accessible to all employees. It is important for these near-site clinics to group services so that they are a 'one-stop shop' for employees. Another emerging trend is smaller employers joining forces to cosponsor a clinic, building a critical mass of users that makes the workplace clinic feasible. Paladina Health is one provider who offers this pooled-resource approach, extending the benefits of the workplace model of primary care to a wider population. Todd Olson brings over 25 years of medical programming, planning and design experience as Director of Healthcare at McGranahan Architects.